Prior to Facebook taking center stage, Bebo was one of the most popular of the social networking sites. Back in the mid-1990s some of you may remember Bebo. This website was developed and launched during the days of MySpace and Hi5 when social networking was first taking root in the Internet community. After being around for nearly a decade, Bebo. Inc. was sold off in its entirety to AOL (America Online) for $850 million in 2008. During that same timeframe Facebook launched mobile apps for all mobile devices as well as built-in support on Internet-connected televisions, DVD players, gaming counsels, and even some in-dash automotive devices; Facebook soon became the social networking site of choice for the masses, leaving Bebo in the dust. As numbers started to dwindle and traffic Bebo’s website declined, AOL tried implementing new features, causing instability and the loss of some users’ archived photos. This act by AOL was like driving the final nail in the coffin of an already half-buried Bebo. When the creator of Bebo, Michael Birch, saw what was happening to his “baby,” he offered to buy the company back for a cool $1 million in 2013. After Birch made $849 million from the sale and buyback of his company, he decided a complete overhaul was in order to save his dying dream. Keeping only the name and the account/photo archives, Birch and his team of code writers were hard at work coming up with a new idea involving social media and what they imagined the company’s direction to be. After a year or so of being redesigned, Bebo’s original platform was scrapped and built form the ground up into a social messaging application available to both iOS and Android devices. Microsoft’s Windows Phone and Amazon’s Fire Phone were overlooked since the majority of the market lies in iOS and Android devices. If you use Windows 8.1 or Fire OS don’t expect to see the Bebo app for a while. The new Bebo is considered or described as a mix between What’sApp and Snapchat, relying mainly on social messaging — but with a twist. 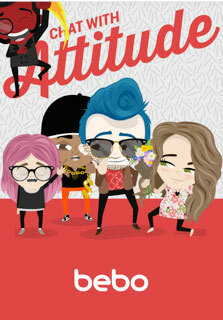 Bebo was designed to use hashtags (#) heavily as well as avatars acting out what you put in your hashtag. For instance, if a friend were to message you, “Want to hang out tonight?” you can reply with something like “I can’t I have a #DateNightWithNetflix.” The message as well as an image, known as a Beboji, is shown with your avatar sprawled out on a couch covered in popcorn. When first downloading and opening the application, you are asked to either watch a short video on what Bebo is, or you can skip that step and go straight to creating your account. After your account is created, you are asked to create an avatar or avi. The options for customization are boundless here, where you can choose from tons of different types of accessories, body and face shapes, clothing, hairstyles, as well as the colors for each. You can create an avatar that looks almost identical to what you really look like (in a cartoon sort of style), or you can create one that suits your inner style. After the account and avatar creation is completed, you are ready to message your Bebo friends — don’t forget to use hashtags! The description in the app store goes on by saying “Hashtag anything! No, seriously anything!” meaning they have created animations for just about every topic you can think of. For example: #EatingACookie will do just that — show your custom avatar eating a cookie. You can even go into more detail like #EatingAChocolateChipCookie, and it will even show the type of cookie you are talking about! This technology is overly sophisticated and intuitive for how silly this oddball app actually is. #Draw lets you do a quick doodle to send to your friends. Customizable colors are available. #Music lets you share your music with your friends. #OldPhotos asks for your old Bebo.com user account info so you can have an email sent to you with all your old blogs and photos archived from the old bebo.com website. #FlappyHead lets you play the Flappybird game from within the Bebo app, but replaces the bird with the head of your avatar.